I’ve always loved to cook but since I’ve fallen in with all these London food bloggers who cook and review restaurants, I’ve gotten a bit shy about my cooking abilities, so to speak. I do, however, know how to cook and although I might not make very exotic or time intensive recipes, it usually comes out pretty darn tasty. At least my flatmate, Giordi, likes my cooking. Score one for The Winesleuth. So, when I got an invitation to take part in the www.sofeminine.co.uk latest contest to contribute a recipe, I thought I’d enter. Being The Winesleuth, of course, I had to find a wine to pair with whatever I cooked. Usually, when I decide to cook, I look at what wines I have to hand first and then think about what to cook that will go with it. So it was, one Saturday afternoon, I had a look at my wine rack and spied a bottle of the 7 Springs 2010 Sauvignon blanc from South Africa. I had tried the wine about 5 months ago and enjoyed it very much so I was curious to see how or if it had changed. When I had first tried it, I thought with it’s fresh,crispy, citrus character, this wine would probably go well with chicken in some form. So I yelled up the stairs to Giordi, “Hey, do you fancy chicken for dinner tonight?” I heard some sort of agreement and fired up the laptop. I don’t have any cookbooks but I do have the web and found a recipe from an American magazine, Bon Appetite for Chicken with Roast Lemons, Green olives and capers. A very simple recipe that can be made in less then hour, this dish was fantastic. I had to tweak the recipe a little bit as the local Turkish shop only had Turkish olives marinated in lemon (the recipe calls for green Sicilian olives) but the dish came out fantastically. 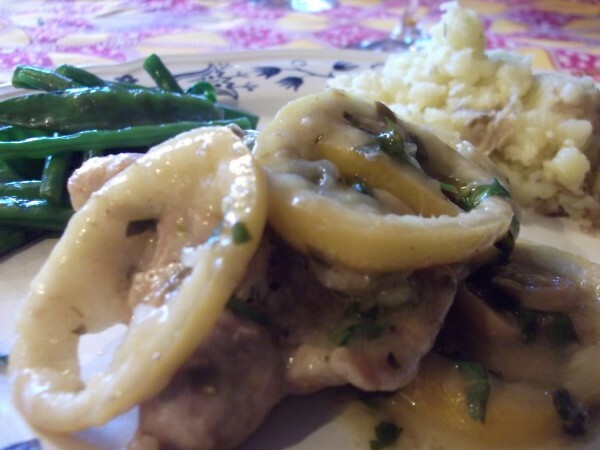 Very tasty and tender chicken and the flavour the roast lemons added were a spritely touch, the dish was so fresh and delicious, loved the olives and capers and with the wine…. fantastic. 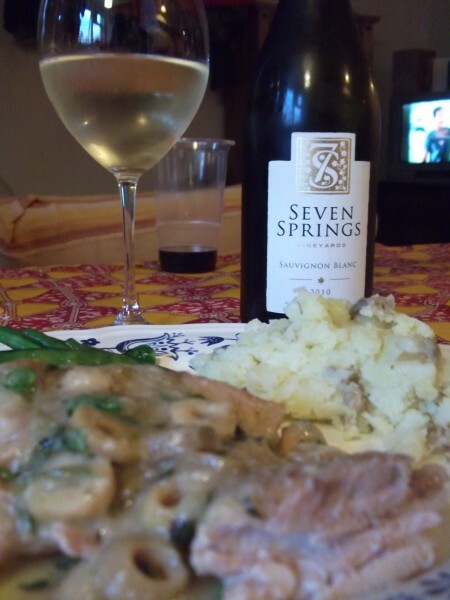 The 7 Springs Sauvignon Blanc tempered the lemony flavours of the chicken but was sturdy enough to not be knocked away by it. An excellent wine to have with a meal, the acidity cut through the rich sauce and cleared our palates for the next round, a well balanced wine. Served along with smashed potatoes and steamed sugar snap peas and green beans, Giordi loved the entire meal and I have to say, I was quite please by it as well. I don’t know if I’m going to win any prizes for it but if you take the wine pairing into consideration, I should certainly be in the running. Sprinkle chicken with salt and pepper. Dredge chicken in flour to coat both sides; shake off excess. Heat 5 tablespoons oil in heavy large skillet over high heat. Add chicken and cook until golden brown, about 3 minutes per side. Stir in olives and capers. Add stock and bring to boil, scraping up browned bits from bottom of skillet. Boil until liquid is reduced to syrup consistency, turning chicken over after 3 minutes, about 5 minutes. Add butter, roasted lemon slices, and 2 tablespoons parsley; simmer until butter melts and chicken is cooked through, about 2 minutes. Season with salt and pepper. Transfer to platter. Sprinkle with remaining 1 tablespoon parsley. This is a lovely blog post Denise. As you Tweeted to me the wine seems to be developing beautifully. Boy am I so chuffed with the way our first wine has worked out. I am going to put this on our Facebook page (Seven Springs Vineyard) right away. Chicken dishes are a perfect match for the wine but I am pleased to see it handled the capers and olives…difficult ingredients sometimes for wines to cope with. Thanks Tim for making such an awesome wine! I really enjoyed it and was pleasantly surprised that it has developed so well. You know, I have had some not very good experiences with other South African wines (no names) so I’m very glad that yours is showing the way for other SA S.blancs!